Lead singer Davis LeDuke’s description of his band, Bad Things, is strikingly resonant. With the ideas of “family” and “home” at the core of the Notre Dame community, we pride ourselves on our relationship to our colleagues and professors. Although Bad Things may be known as “Shaun White’s band,” anyone who has had the opportunity to see the band perform Saturday night at Legends will dismiss such a label entirely. Each of the band’s members is essential, bringing his own personality and energy to the group’s sound. The chemistry on stage and on record is palpable; several of the band members have known each other since childhood. It’s apparent from our interviews with three of the band’s members that those bonds have only grown stronger since. Though the group may share some similar roots, it’s the members’ disparate lives and experiences that shape their sound. As LeDuke explained, “We all listen to different music and we all come from different places, I think it’s really important to have that.” Obviously White’s iconic history as the world renowned “Flying Tomato” is one such “different place,” but he is not the only member with an impressive background. Bassist Jared Palomar is a former member of the San Diego rock group “Augustana” and certainly adds a healthy dose of experience to the young synth-rock group. Fittingly, it is Bad Things’ strong and effective use of harmonies that showcased the group’s strong musical presence. Artistry was sharp all around the entire night and each member played as a unity, no individual members sticking out. Well, maybe Shaun White if you count that red hair of his. Somewhere between the hours of studying, completing the literal stacks of assignments and the late night walk-backs from the library, we at Notre Dame tend to overlook how truly lucky we are to go to such a school. Fortunately for those of us in attendance Friday night, we were all reminded. With a triumphant encore, Bad Things belted out the college classic, “Shout!” and there was not a soul in the audience standing still. Channeling their inner “Animal House,” the ND crowd feverishly danced and sang along, but thankfully, no one busted out their toga. The energy was tangible as LeDuke remarked “It’s really important for the crowd to be excited, and we definitely felt that tonight”. One would have never suspected that some of the band members never had a college experience of their own from the natural collision of their energy with that of students, as they led the crowd triumphantly. Each was tuned-in to one another and simultaneously, to every member of the audience. The impact of live performance on the power and nature of a band’s music can’t be understated. However, for those unable to attend the performance, Bad Things’ eponymous debut is definitely worth checking out. Hosting more than its fair share of indie-pop gems, the studio record is well suited for any sort of youthful adventure. Cycling guitar lines and propulsive drums provide a driving force that carries beachy vocal melodies and harmonies with ease. While Bad Things could easily be criticized for being a par-for-the-course indie-rock record somewhere between The Republic Tigers, The Strokes and modern Tokyo Police Club, there are definitely some differentiating factors here. First of all, Bad Things have crafted some class-A melodies here. On their lead single “Caught Inside,” the higher vocal line on the bridge (singing “Why did you wait so long?”) is absolutely gorgeous and in itself warrants repeat listens. Then there’s the space-rocky “Lonely Eyes,” which benefits greatly from its unique guitar production and unpredictable vocal line. Closer “End of the Road” boasts a perfect shout-along chorus. It’s clear that Bad Things has the pop sensibility necessary to drive them towards greater commercial success in the near future, and the second half of the record displays a range of sound that could soon compete with today’s most revered indie-rock acts. In addition, Bad Things is gifted with a truly remarkable bassist. Palomar manages to punctuate, drive and riff in all the right places on the record; it’s worth listening to the record just to follow around his bass lines, which never interfere with the band’s collective sound but never seem to slip into a predictable pattern. His prior experience with Augustana shines through on “Bad Things” and manages to make push the record to an unexpected height. 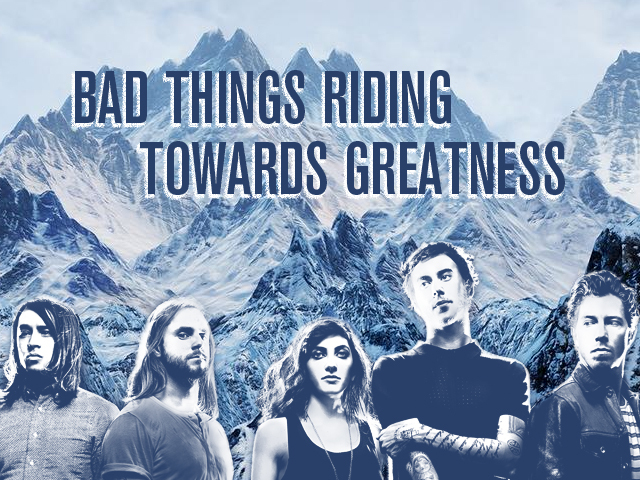 If the individual band members can match his uncanny ability to craft and perform his parts to perfection, there is no doubt we’ll be hearing truly brilliant music from Bad Things down the road. I’d really like to see Bad Things take some more risks in the future. With more complex song structures and more ambitious production, the band could rise through the ranks and compete with groups like the Drums and the Surfer Blood. Regardless, they have the tools to go in several directions from this point. Given the power and energy of their live set, they’ll be accruing fans left and right. How well they ride the waves they’re making is a mystery, but given the chemistry of the band members and the assumed surfing skill of Shaun White, the future is bright indeed. Kelly Bishop memorized Doctor Seuss books when she was five years old and fooled her parents into thinking she knew how to read.... for a little while, anyway. This little girl with a big voice was talented at getting to the bottom of things; she relentlessly bombarded everything that moved with often unanswerable "but why?"s. She has never really stopped. Soon after surmounting her crippling fear that she might make mistakes when learning to read, she took to writing more smoothly. After all, you can't really make mistakes when you're calling the shots. Anyway, who doesn't like to talk more than listen?! Since discovering this passion at a young age, she has tattooed her mind across countless notebooks that have come to contain her soul, used her writing as a force for good whenever possible, and even satisfied some of her endless "why"s using only her pen and mind.